Marshville, Union County, North Carolina.click on photo for larger view. . This photograph belonged to my mother, Pauline Hinson Haney. The names of the individuals were written on the back of the photo. She was married to my father, James Rell Haney on June 29, 1935. My Dad died May 17, 2007 and my Mom died in June 10, 2010. The legend with the married names of the female members of the class came from a newspaper article published in the Home News in 1985. Row 1 Mascots: Conway Bolt held by Nell Newsome and Doris James held by John Henry Adcock. 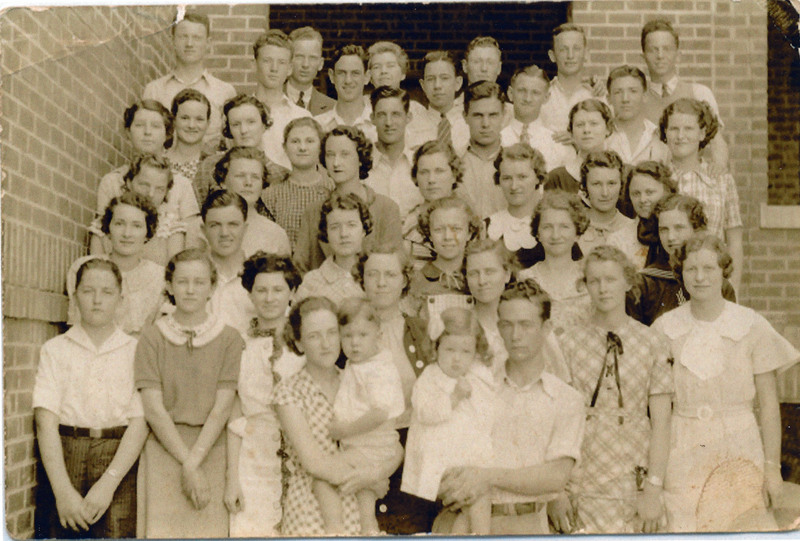 Row 2 Hubert Stegall, Lillian Phifer, Mary Truett Coggins, Geneva Austin, Mildred Allen, Faye Broome, Billie J. Griffin. Row 4 Pearl Nash, Lurleen Rollins, Virginia Helms, Eva Lee Holmes, Aileen Simpson, Pauline Hinson, Gladys Strawn, Margie Strawn. Row 5 Wilma Davis, Mildred Griffin, Faye Griffin, Hugh Griffin, Boyce Baucom, Ruby Stegall, Aileen Brewer. Row 6 Fred Lane Horton, Joe Russell, Winfred Hill, Roy Stegall, Byron Lee, Roy Harrell. Row 1 Mascots: Conway Bolt held by Nell Newsome (m. 1st Eddie Johnson, 2nd Robert Grant) and Doris James (Jones) held by John Henry Adcock. Row 2 Hubert Stegall, Lillian Phifer (Craig), Mary Truett Coggins (Stevens), Geneva Austin (Turner), Mildred Allen, Faye Broome (Kinsey) Billie J. Griffin. Row 3 Thelma Whitley (Nixon), Hoyle Marsh, Virginia Edwards (Herster), Frances Griffin (Stevens), Doris Lee (Shelton), Johnnie Collins (Horne). Row 4 Pearl Nash (Fox), Lurleen Rollins (Myers), Virginia Helms (Rhyne), Eva Lee Holmes (Turner), Aileen Simpson (Brenner), Pauline Hinson (Haney), Gladys Strawn (Bullard), Margie Strawn (Turner). Row 5 Wilma Davis, Mildred Griffin (Nash), Faye Griffin, Hugh Griffin, Boyce Baucom, Ruby Stegall (Helms), Aileen Brewer (Nixon). Row 7 Principal E. D. Johnson, Teacher Miss Matthews, Max Stewart, L. L. Parker, Robert E. Baucom.